Ronald B. Adler is Professor Emeritus of Communication at Santa Barbara City College. He is coauthor of Understanding Human Communication, Twelfth Edition (OUP, 2013), Looking Out, Looking In (2014), and Communicating at Work: Principles and Practices for Business and the Professions (2013). In addition to his academic pursuits, Ron works with businesses and nonprofit agencies to improve communication among coworkers as well as with clients and the public. Lawrence B. Rosenfeld is Professor of Communication Studies, University of North Carolina at Chapel Hill. His articles appear in journals in communication, education, social work, sport psychology, and psychology, and he is the author of books on small group, interpersonal, and nonverbal communication. His most recent book is When Their World Falls Apart: Helping Families and Children Manage the Effects of Disasters (2010). In 2000, Lawrence received the Donald H. Eckroyd Award for Outstanding Teaching in Higher Education from the National Communication Association, and in 2006 received the Gerald M. Phillips Award for Applied Communication Research from the same national communication organization. In 2012 he received the William C. Friday Award for Excellence in Teaching from the University of North Carolina at Chapel Hill. Russell F. Proctor II is Professor of Communication Studies at Northern Kentucky University. He teaches courses in interpersonal communication, interviewing, and communication pedagogy and won NKU's Outstanding Professor Award in 1997. Russ has also received recognition for his teaching from the National Communication Association, the Central States Communication Association, and the Kentucky Communication Association. 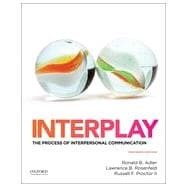 In addition to his work on Interplay, he is coauthor (with Ronald B. Adler) of Looking Out, Looking In (2014). · Assessing Your Communication: What is Your Intercultural Communication Competence? -Focus on Research: Does Honesty Hurt? Receivers Say "Yes," Senders Say "No"
-Dark Side of Communication: The Inequality of "Lookism"
-Focus on Research: Online Ranting: Helpful or Harmful? -At Work: Can Women Be Coworkers and Friends? -Focus on Research: Friends or Lovers? What about Both? -Toxic Conflict: The "Four Horsemen"